Twinges. Painful teeth. 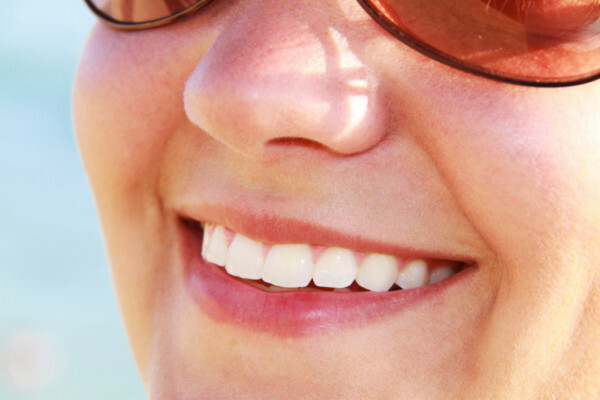 About one in 10 people suffer from dental sensitivity caused by worn enamel. But rather than providing short-term solutions like special toothpastes or fillings, new techniques could print whole new layers of enamel onto teeth – or even stimulate the body to grow new ones. Dr Antonios Anastasiou wants to be able to print you a new tooth. He’s not there yet, but a collaboration of material scientists, laser engineers and clinicians at the University of Leeds in the UK, have reached an important milestone along the way. They can print new layers of enamel onto the surface of teeth, preventing the exposure of tiny holes called dentine tubules, that can cause wincing sensitivity to hot and cold as well as become breeding grounds for the bacteria that cause cavities. Right now, the materials that dentists use to repair enamel can’t provide more than a temporary fix. They fade with time, and leave voids that bacteria can get to. The technology being explored by Dr Anastasiou should overcome these problems. ‘We use a material similar to the natural mineral of teeth like hydroxyapatite or some other type of calcium phosphate,’ Dr Anastasiou explained. That new material can be printed onto teeth using a femtosecond laser, which heats up small iron oxide nanoparticles in the material to bond it to the existing dental surface. The small heating area avoids damaging the surrounding tooth. They can also add cerium and other exotic elements to the mix to give the new material antibacterial properties. ‘Not only can we restore enamel with a material similar to the original mineral of teeth, we can also improve it. What we are doing is figuring out how to prevent bacteria from colonising the surface,’ said Dr Anastasiou. His solution is also longer lasting. While current restoration materials like resins can shrink over time or with temperature, his material does not. It is also a material that makes it easy for gums to reattach to, helping to prevent an infection of the gums around the mouth known as periodontitis. Right now, the technique is being trialled as an appliance in dental schools to make sure that there are no long-term side effects and that it can hold up to the rigours of daily life. ‘Some patients have it in their mouth and are taking care of it, brushing it, and having it on during eating. If these tests are positive then we can go on to clinical studies,’ he said. Ultimately, the printed enamel could be out in the marketplace in about five years, and could help those who suffer from worn enamel enjoy hot and cold drinks without sensitivity. ‘One of our professors said that he got into the research because he wanted to enjoy his whisky with ice,’ Dr Anastatiou joked. Printing tooth repairs is one thing, but what if your body could be stimulated to regrow a tooth that is lost or damaged? That’s the aim of Dr Igor Adameyko from the Medical University of Vienna, Austria, who is trying to uncover the secret of how to induce the formation of new teeth using stem cells. But to do that, he first needed a map. ‘For a long time, nobody knew how many cell types and subtypes live in teeth. This knowledge is essential to understand how this organ is developing, growing, and maintaining itself,’ said Dr Adameyko. To undertake such a cell census, he used a process known as single-cell transcriptomics. This new method can break down cells one by one, measuring the RNA – a key molecule similar to DNA that controls which genetic instructions are put into action – of thousands of cells at the same time. By examining the RNA blueprint of a cell, researchers can figure out what its type and function is. Through that painstaking process, the team has built up an atlas of all the cell types that live in teeth which has also helped him understand how different types of cells interact. ‘Cells exchange signals, and these are not some kind of ethereal signals, but quite material. Molecules are made and secreted, and some cells have receptors that can bind to these molecules. We can actually see these pairs in the data set and predict these interactions,’ he said. Armed with that knowledge, his team has honed in on what controls the life and death of a tooth, as well as what controls the conversion of cells known as glial cells, a type of cell that surrounds and insulates neurons, into dental stem cells that can grow teeth. Teeth originate from two different types of embryonic tissue – epithelia, which generates cells producing enamel, and mesenchyme which can become bone or the living tissue inside the tooth which is called dental pulp. Dr Adameyko and his team have also been investigating dental development and regeneration in mice, whose teeth grow throughout their lives because they feed on hard food. Using special chemical manipulation they made the mice’s teeth transparent and watched what happened to the tracked glial cells. Such knowledge could help the team figure out how to activate glial cells to convert into new stem cells in humans, to grow new roots for regenerating live teeth or crafting a new nerve for a dental implant. ‘If this exists in human teeth, by doing this we will be able to find some molecules that strengthen the tooth’s reparative response,’ Dr Adameyko said. Previous How does CRISPR work?